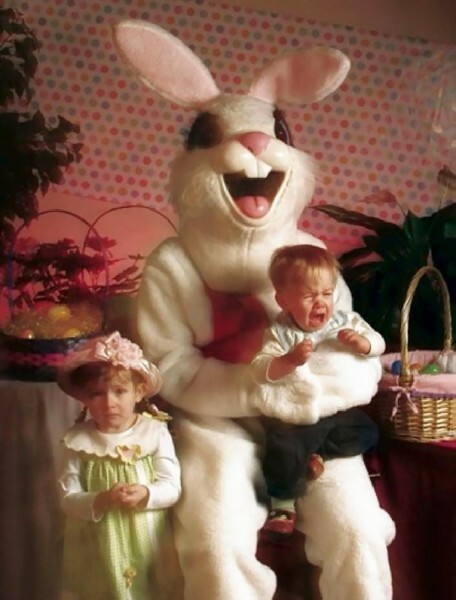 I can bet you still don’t know why rabbits became associated with Easter. This happened with churches when many believed that it was hermaphrodite. It was believed that a rabbit could reproduce without losing its virginity, which then led to hares being linked to the Virgin Mary. As for the eggs, it all started with Orthodox churches abstaining from eating eggs during Lent. German protestants continued the custom of eating eggs but not fasting, and brought it to the US in the 18th century. With them came the tradition of the Easter Hare bringing eggs as gifts to good children. Since bunnies became associated with Easter as Santa Claus is to Christmas, every Easter you would see people in the bunny suits come out to bring out the vibe of the time in malls, parks and other popular public places. Some of them can be terrifying to take pictures with, and these kids in the photos below undoubtly agree. 1. Yipee! Two more children on my menu.